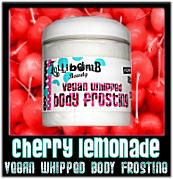 WHAT: Lollibomb Beauty – Vegan and handcrafted bath, body, and cosmetic products. HOW: Sitting behind a desk in a commercial real estate office, Luca Cusolito needed a diversion. She was busy – working a desk job while simultaneously pursuing a college degree – but, as she says, “the siren song of business ownership was calling me.” Having done some research, Cusolito discovered Etsy.com – an online retailer featuring thousands of unique, handmade products. “I was immediately smitten by the spirit of the handmade movement and all the inspirational people that sold their DIY creations,” says Cusolito, and with an idea for unique cosmetics, she launched Lollibomb. Cost-conscious, Cusolito started small. “Ingredients, incorporation, and product liability insurance included, I think I started up with less than $3,000,” says Cusolito. Only offering a few products at first, she took advantage of social media to spread the word about her line, in lieu of pricy advertising. “Free samples to test-drive new fragrances and earn reviews also helped propel Lollibomb in its infancy,” she adds. In her first year and a half on Etsy.com, Cusolito made over 2,300 sales – a number that earned her company recognition on the site. However, after slowing down a bit in 2009 (when “life intervened,” she says), Cusolito is kicking back into gear – with some goals set for 2010. This year she hopes to take on a partner – which she believes will really propel the business’ success. Along with introducing seasonal fragrances, Cusolito hopes to add another incentive to buying some of her lip balms and lotions – artsy packaging that doubles as a collectible tin.